Does your resume serve you as well as you serve your customers? To be considered for top customer service manager jobs, you need to make sure your skills come through. 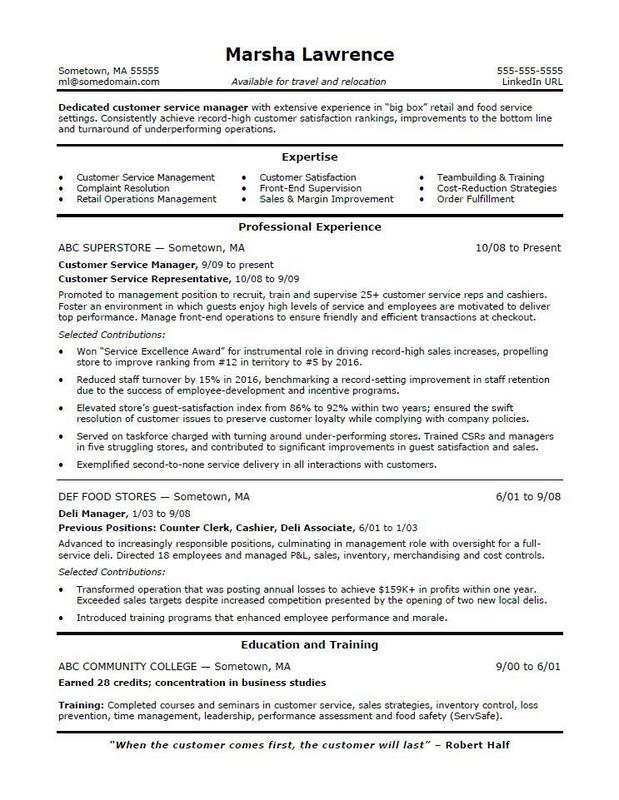 Let this sample resume for a customer service manager guide you. You can also download the customer service manager resume template in Word. Jobs for customer service managers are projected to grow by 5% (or 136,300 jobs) from 2016 through 2026, according to the Bureau of Labor Statistics (BLS). You’ll find the highest level of employment for this job in the following states: Texas, Florida, California, New York, and Pennsylvania; and in the following metropolitan areas: New York City, Atlanta, Chicago, Phoenix, and Dallas. As a customer service manager, you can expect to make a median wage of $32,890 per year, or $15.81 per hour, according to the BLS. Additionally, you can learn more about customer service careers and search for customer service manager jobs on Monster. Dedicated customer service manager with extensive experience in “big box” retail and food service settings. Consistently achieve record-high customer satisfaction rankings, improvements to the bottom line and turnaround of underperforming operations. Promoted to management position to recruit, train and supervise 25+ customer service reps and cashiers. Foster an environment in which guests enjoy high levels of service and employees are motivated to deliver top performance. Manage front-end operations to ensure friendly and efficient transactions at checkout. Won “Service Excellence Award” for instrumental role in driving record-high sales increases, propelling store to improve ranking from #12 in territory to #5 by 2016. Reduced staff turnover by 15% in 2016, benchmarking a record-setting improvement in staff retention due to the success of employee-development and incentive programs. Elevated store’s guest-satisfaction index from 86% to 92% within two years; ensured the swift resolution of customer issues to preserve customer loyalty while complying with company policies. Served on taskforce charged with turning around under-performing stores. Trained CSRs and managers in five struggling stores, and contributed to significant improvements in guest satisfaction and sales. Exemplified second-to-none service delivery in all interactions with customers. Advanced to increasingly responsible positions, culminating in management role with oversight for a full-service deli. Directed 18 employees and managed P&L, sales, inventory, merchandising and cost controls. Transformed operation that was posting annual losses to achieve $159K+ in profits within one year. Exceeded sales targets despite increased competition presented by the opening of two new local delis. Introduced training programs that enhanced employee performance and morale. Training: Completed courses and seminars in customer service, sales strategies, inventory control, loss prevention, time management, leadership, performance assessment and food safety (ServSafe). As a customer service manager, you know the customer comes first. The same is true for your resume. Does it make it easy for a hiring manager to quickly understand why your skills and experience make you the perfect fit for the job? Not sure? Get a free resume evaluation today from the experts at Monster's Resume Writing Service. You'll get detailed feedback in two business days, including a review of your resume's appearance and content, and a prediction of a recruiter's first impression. Let Monster's experts smooth out the details, just like you do for your customers.